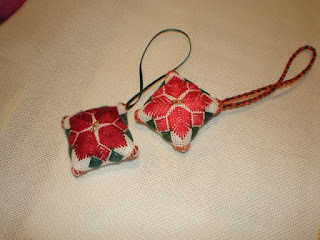 Didi's beaded goodies: Still Stitching. Several pieces of stitching have been done since the opunake retreat. I nearly finished all the flowers on my latvian piece and only have the borders to do. managed to get the finishing instructions for our linen biscornu and have the night class group onto that over the next weeks. I have started one of the ANG auction pieces which is fun and mum has also started a piece as well. Made several patchwork things for the guild christmas party and nearly have my door prize sorted. Next thing to do is my gift as well as secret santa gift for school. My institute box is nearly finished so only needs wrapping and labelling (tonights job which is running late). 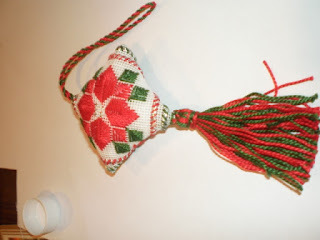 I am hoping to put the pictures of the night class ornaments that have been stitched and one was finised with a lovely tassel and candycane cord by Fiona who has not done any of these things. I am so proud of her. Scissor keeps made in class.